Ukrainian drivers are as fond of using dashboard cameras as their Russian counterparts, a "phenomenon" that has recently become known internationally thanks to the Chelyabinsk meteor. 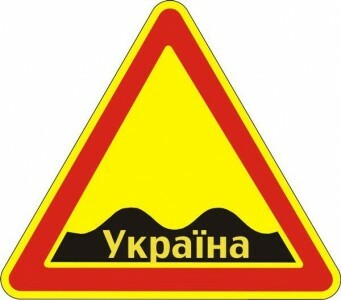 This winter, Ukraine's roads have grown so grotesquely potholed - as if hit by hundreds of small meteors! - that many drivers couldn't help sharing their dash cam videos online. 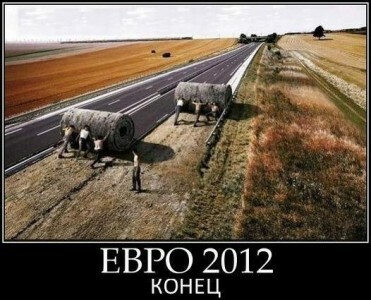 Below is a small selection of the recent footage documenting Ukrainian drivers' bumpy riding routines. Among other things, Nazar Kovalyshyn, the author of the last video in the selection above, mentioned that the Ternopil-Lviv road had been repaired for the 2012 UEFA European Football Championship, which Ukraine co-hosted with Poland last summer, spending $6.6 billion from its budget on preparations for the event. These preparations included large-scale road repairs in the host cities and all over the country. In Sept. 2011, President Yanukovych was quoted saying that he was "confident that the infrastructure built in Ukraine [would] serve many generations." The newly-repaired roads, however, have failed to survive their first winter - which says a lot about the quality of those costly repairs and confirms that Ukraine's reputation as one of the world's most corrupt countries is well deserved. Where does the price of 40 million hryvnias per kilometer come from?????????? It is $5 million!!!!???? Can anyone from the government conduct an audit and adequately and in detail explain in the mass media what this price is made of? [...] The price of an autobahn in Germany is something I am able to understand. The materials, salaries, and, above all, the RESULT, can cost this much. But in Ukraine, where the materials are not imported, where salaries are dozen times lower than in Germany, and where there is NO RESULT, a road cannot cost this much. [...] Trust me, I'm a long-time supporter of your political party and you personally. But I would like to tell you honestly that with each new election, I simply do not know what to reply to my opponents! There are no visible results! Take photos, shoot video and post in the "I Hate UkrAvtoDor" group, if you accidentally come across a good road. Recently, there have been attempts to hold rallies in Kyiv to draw the authorities' attention to the road problems. Even though over a thousand people expressed their willingness to come to the UkrAvtoDor office on Feb. 18 [ru] and place car parts that broke off due to potholes by its entrance, only about 30 car owners (and many more journalists) actually showed up. Another action [uk], during which drivers were supposed to stop by the Cabinet of Ministers on Feb. 20 to change tires on their cars, also drew only a few dozen participants. To catch the relevant authorities in their offices, both events were scheduled to take place during work hours, but this strategy backfired, as many of those who wanted to attend, were busy working, too. Other related citizen initiatives include UkrYama [uk, ru], inspired by the Russian project RosYama (more about it in this RuNet Echo text by Teplitsa/Greenhouses of Social Technologies), and 4road.net/Public Control [uk, ru]. An umbrella Facebook group - "The Ruin of Ukraine's Infrastructure. Enough!" [uk, ru] - has recently been set up to coordinate individual and group efforts to prevent the infrastructure collapse in Ukraine.